Dorothy Lamour is known primarily for her "srtaight man" roles opposite the comic antics of Bing Crosby and Bob Hope in the Road movies, made between 1940 and 1962. A singer originally, Lamour toured in dinner theatres after her movie star began to fade. Born to parents who were both working as waiters, Mary Leta was of French Louisianan, Spanish and Irish decent. Her parents divorced when she was two, with her mother remarring to Clarence Lambour, but they divorced while she was in her teens. Mary Leta dropped out of high school to help pay the bills. She entered beauty pageants, and was crowned "Miss New Orleans" in 1931, at the age of 17. After relocating with her mother to Chicago, she was spotted at a local talent show by bandleader Herbie Kay, who offered her a job, touring with his band. Dorothy Lamour was now appearing in vaudeville and radio with Kay, whom she married in 1935. That same year, she had a 15-minute radio program on NBC. She also appeared in Rudy Vallée's The Chase and Sandborn Hour on NBC radio. Lamour moved to Hollywood, screen tested and was signed up by Paramount, where she made her debut in College Holiday (released in December, 1936). She got top billing over Ray Milland in The Jungle Princess (released in December, 1936, where she was clad in a sarong — which became her signature "look" for the rest of her career. Lamour was now headlining in The Hurricane (released in November, 1937), with Jon Hall, Spawn of the North (released in August, 1938), with Geroge Raft, Disputed Passage (released in October, 1939), and Johhny Apollo (which played the Chinese in April, 1940), with Tyrone Power. Bob Hope had heard Lamour's singing and suggested her for the role of "straight man" in a picture he was making with Bing Crosby called Road to Singapore (released in March, 1940). Hope invited Lamour to sing in his USO shows, and she accepted, beginning in May, 1941. Lamour co-starred in the next Road film, Road to Zanzibar (released in April, 1941), which became a huge hit also. So was Beyond the Blue Horizon (released in June, 1942). The Road films had become so popular that Lamour and Bob Hope were asked to make their impressions at the Chinese together (Bing Crosby had been imprinted in April, 1936). Hope and Lamour would star together in They Got Me Covered (which would play at the Chinese one week later, in February, 1943). She and Hope remained friends for the rest of their lives. The Road films continued with Road to Morocco (released in April, 1943), and she co-starred with Bing Crosby in Dixie (released in June, 1943). Lamour was a hugely popular pin-up girl during World War II, which allowed her to contribute to the war effort by selling War Bonds, where she was nicknamed "The Bond Bombshell" for her great success selling War Bonds. She also put in many hours at the Hollywood Canteen, where she danced and chatted with everyday soldiers on leave. Lamour's, postwar films include: A Medal for Benny (released in April, 1945), Road to Utopia (released in March, 1946), My Favorite Brunette (released in April, 1947), with Bob Hope, Road to Rio (released in December, 1947), Our Merry Way (released in June, 1948), Slightly French (released in February, 1949) with Don Ameche, The Greatest Show on Earth (released in May, 1952), with Charlton Heston, Road to Bali (released in January, 1953), The Road to Hong Kong (released in May, 1962), and Donovan's Reef (released in June, 1963) with John Wayne. Dorothy Lamour did a fair amount of guest-starring on television, on shows such as: Burke's Law in January and September, 1964, I Spy in October, 1967, The Name of the Game in October, 1969, Love, American Style in January, 1970, The Love Boat in December, 1980, Hart to Hart in January, 1984, Crazy Like a Fox in April, 1986, Remington Steele in December, 1984, and Murder She Wrote in March 1987. In the 1960s, Lamour found success as a singer, touring dinner theatres, and appearing in bus and truck tours of Broadway musicals, including Hello, Dolly! She made one last film, Crteepshow 2 (released in May, 1987), in which she rather enjoyed playing opposite George Kennedy. Having divorced Herbie Kay in 1939, She married ad executive William Ross Howard III in 1943, with whom she had two sons; they remained married until his death in 1978. 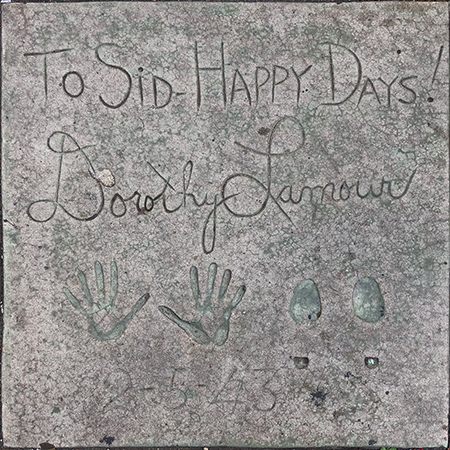 Lamour published her autobiography, My Side of the Road, in 1980. She passed away at her home in North Hollywood in 1996 at the age of 81. Grauman's Chinese Theatre, Hollywood, California. Dorothy Lamour Forecourt ceremony, Friday, February 5, 1943. 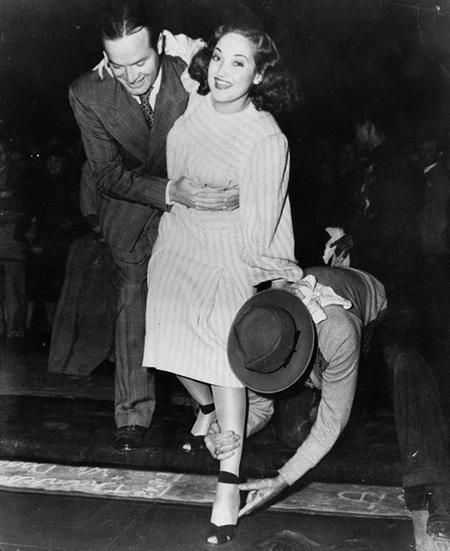 Bob Hope helps steady Dorothy Lamour as cement artist Jean Klossner makes an impression of her shoe.